Experts from WHO/Europe and its partners will answer questions on antibiotic resistance during a live Twitter chat on 18 November 2014, from 13:00 to 14:00 CET (12:00–13:00 UTC/GMT). The chat is part of global activities, also taking place across the WHO European Region, to emphasize the importance of the prudent use of antibiotics and to mark European Antibiotic Awareness Day (EAAD). It will be jointly hosted by experts from WHO/Europe, the European Centre for Disease Prevention and Control (ECDC), the European Commission Directorate-General for Health and Consumers, the European Food Safety Authority (EFSA) and the European Medicines Agency (EMA). In 2014, EAAD focuses particularly on pharmacists’ influential role in combating antibiotic resistance, within the broader theme of the dangers of self-medication and the importance of getting a proper medical diagnosis before taking antibiotics. 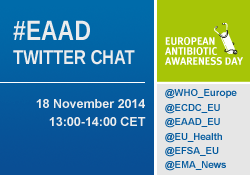 Tweet questions in English to @WHO_Europe or in Russian to @WHO_Europe_RU, using the hashtag #EAAD. Antibacterial medicines, also called antibiotics, are used to prevent and treat bacterial infections such as tuberculosis and bloodstream, wound, respiratory-tract and sexually transmitted infections. Their overuse, misuse and underuse have led to increasing resistance to these medicines. The overuse and misuse of antibiotics in human and veterinary medicine, as well as in the food industry, can lead to the accelerated emergence of resistant bacteria and genes that threaten human health. Antibiotic resistance, especially in relation to hospital-acquired infections, is gaining priority as a public health issue. A key reason is that new medicines are not coming on the market soon enough, so preserving the effectiveness of existing medicines is key.